Dicksonia antarctica (manfern or soft tree fern) is one of Tasmania's three tree fern species (all are native). 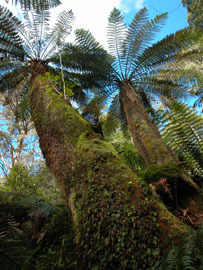 It is the only species of the genus in Tasmania and by far the most common tree fern on the island. It can be found in wet sclerophyll forest and rainforest throughout Tasmania (except in at high altitudes and on very nutrient poor sites). It has a thick fibrous trunk (often ~20-30cm wide at mid height), that may be as much as 15m tall. The leaves are many times pinnate and the sori are at the margins, protected by a hard flap of tissue from the lamina (an indusium) as well as the recurved margin. 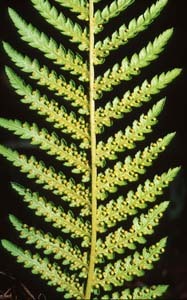 This species almost universally called manfern, but the less often used common name (soft tree fern) refers to the fibrous trunk, not the foliage itself, which is much harder than that of the other tree ferns (Cyathea species). 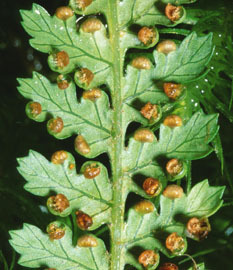 Immature, trunkless plants can be confused with Polystichum proliferum, but that species has dark brown scales on the undersides of the leaves.